1. 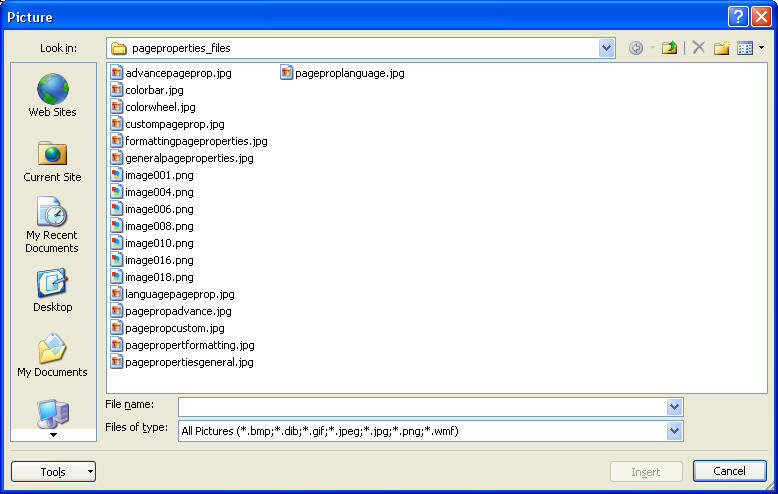 Identify the differences among image file types. 2. Evaluate the purpose of Alternate text. 3. Determine the Float property value to wrap text. 5. Create a border and white space around images. 6. Change the size of an image. 7. Modify the contents of an image. 11. Create a folder for images. 1. Background color can enhance a web pages appearance and readability. 3. 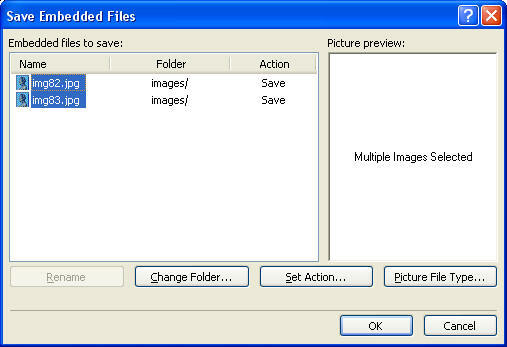 GIF - graphic interchange format (loosless compression), JPG - Joint Photographic Experts Group(lossy compression), and PNG Portable Network Graphic(loosless compression) , BMP (window bitmap, avoid using) and TIFF (tagged Image File Format- scanned images) are fivetypes of pictures used in web sites. 4. a background pictures can be almost any picture file. 5. 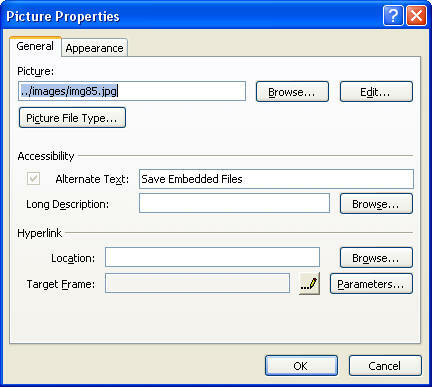 A picture is called an embedded file and is not part of the web site until it is saved into the images folder. 6. Before you crop a picture save a back up. The croped image can not be restored back. 8. Alternative text is a short phrase that identifies or describes a picture in a web page. Required for 508 compliance. 9. Conversion to other file types. JPEG Best for Photos. Accurate color and small files size. 10. A transparent color will not be visible allowing the background color to come through. 11. Insert a image using menu bar. a. Place cursor where you want image. d. Fill in the alternative text to describe your picture and click ok and the image is inserted. f. <img alt="alternate text will be here" src="name originalAttribute="src" originalPath=""name" of file.jpg" width="300" height="360"> The code may be a little different for your picture. a. If you need to click change folder to the images folder and click ok.
13. 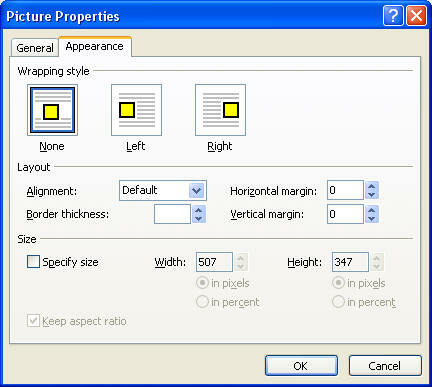 Picture Properties: size, position, and appearance can be changed. b. Appearance here you can change the border thickness, horizontal margin, vertical margin, wrapping style, and aligment. 14. Creating margin space and adding border to picture. Margin space is white space that is outside an element or object. a. Double click picture, click the appearance tab on the picture properties. b. Click in border thickness, and type 6 or whatever thickness you want. 16. Auto Thumbnail is a small image that when clicked displays a new web page with a larger version of the image. a. Click the image to select it. b. Click view, toolbar, picture. c. Click auto thumbnail button on the pictures toolbar. a. browse for the file, double click it when found, click ok.
18. CSS Clear Property - use to position one element past another element - example <h1> tag conflicts with image. a. Values for the clear property. 1. Every Time you do a new activity in Expression Web click on the html display and look at the HTML code for the activity. Expresson web is an HTML editor. By checking the HTML code page frequently you will soon be able to write in the code.